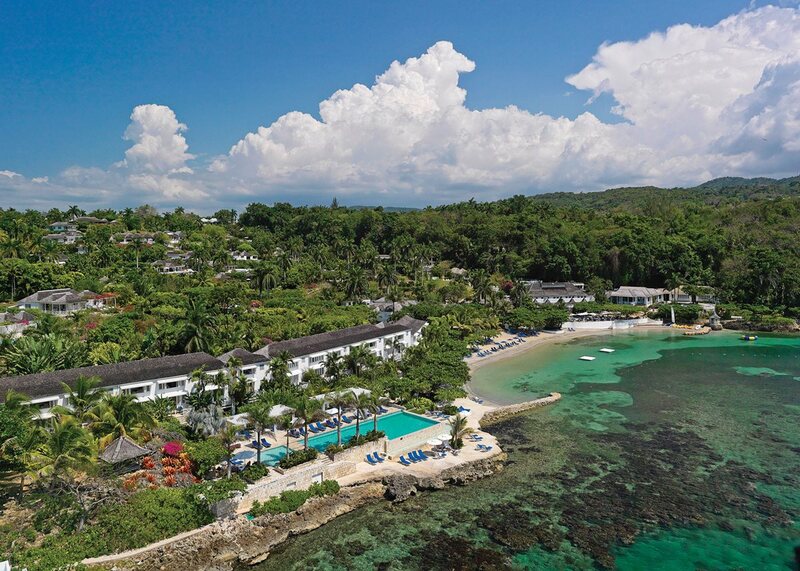 When it’s thriving, the elkhorn coral native to the reef in front of Jamaica’s 129-room Round Hill Hotel and Villas spreads in thick branches that look like gilded antlers. “The entire seascape used to be a golden color,” says Andrew Ross, a marine biologist and managing director of the coral restoration organization Seascape Caribbean. When he noticed a few years ago that environmental damage was turning the reef green and brown, he approached Round Hill with a plan to restore it, by creating a coral garden and propagating seedlings for replanting. Eager to help, the resort offered to fund the project, and today, Ross is one year into a three-year mission to establish 5,000 new corals. The multidimensional plan not only tackles environmental issues, but addresses social sustainability too, by persuading local fishermen to avoid the replanted areas – critical nurseries for young fish – and training them to become guides who will lead guests on snorkeling tours. “The elements of protection, building the ecosystem, and the return of fish are now being directly monetized by the community, giving them incentive to protect the reef,” Ross says. Round Hill plans to eventually let scuba-certified visitors take part in reef gardening with marine scientists and area fishermen. More Round Hill sustainability wins: A recycling program and on-site organic chef’s garden. From Portugal to Thailand, every Six Senses property is home to an on-site Earth Lab, where eco-friendly projects include growing organic gardens, recycling or upcycling glass, generating solar and biomass energy, and distilling natural insecticides. Guests can participate in lab workshops such as learning how to make organic toothpaste and natural mosquito repellent, or turn old towels into flowerpots. 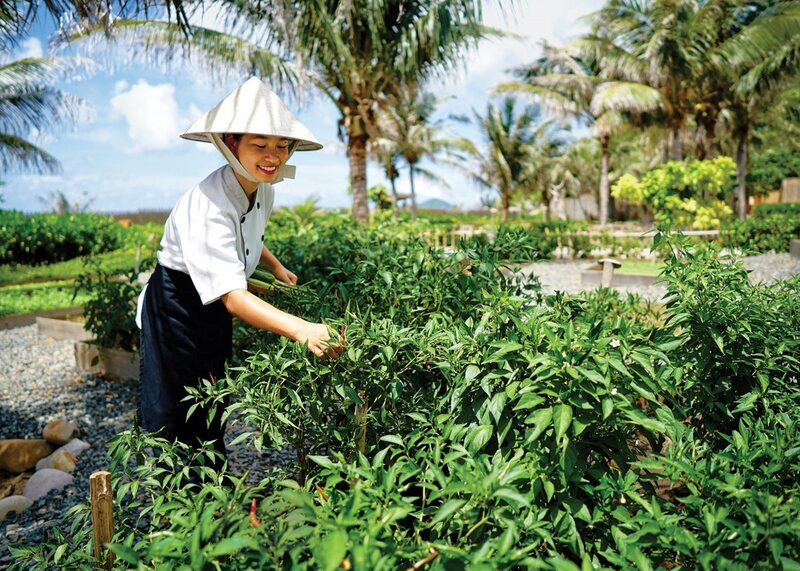 Gardening for good at Six Senses Con Dao in Vietnam. In Australia’s Greater Blue Mountains Area, the 40-villa Emirates One&Only Wolgan Valley offers a daily conservation activity on its 7,000-acre property, a carbon-neutral wildlife reserve. Together with the resort’s field guides, guests plant native trees and shrubs, survey wombats, monitor feral animals, or collect native seeds. One of the highlights of a stay at South Africa’s 21-room Ulusaba Private Game Reserveis a customized, daylong visit to the surrounding Shangaan villages, where you can read to schoolchildren or kick a ball around with the local soccer team. All proceeds from the tours benefit local villages. These souvenirs support local communities. Tierra Atacama Hotel & Spa, Chile: Rustic tabletop llama sculptures carved from indigenous liparita stone by Alejandro González, a local artist, musician, and community leader. Sculpture, $100. Singita, South Africa: Furniture, artwork, and colorful tableware from local Zulu weavers, whom the safari company helps train in production and business prac- tices. Tableware from $12. 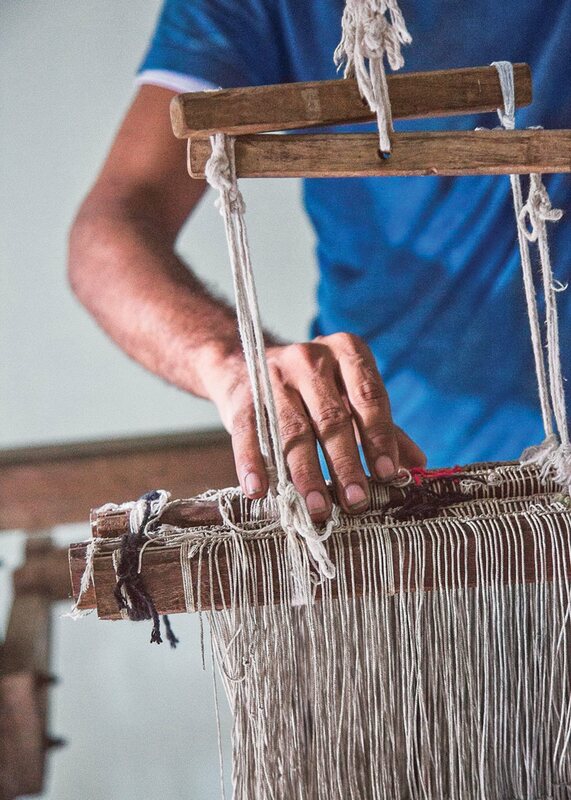 Uxua Casa Hotel & Spa, Brazil: Beach bags, totes, throw blankets, and pillows made on-site with an antique loom by the hotel’s resident “dream weaver,” Evandro Campos Nogueira. Items from $130. Handmade goods from Uxua Casa Hotel & Spa.